The only thing I’ve seen which could be construed as a crossover is usually mounted on the back of the tweeters (an in-line capacitor). Some Component amps will feed different speakers and may control individual frequency response if drivers are driven separately, but I doubt Ford went to that extreme. No coils on low range drivers, they just feed full spectrum because they will drop off eventually. Thanks Jim, I tend to agree with you as my center speaker in the 2016 F-150 had that same set-up mounted on the backside as well. Wanted to share with everyone that the Metra Adapter Plate (82-5605 for 14 and up F-150) fits perfectly for the door woofers (6.5" mounts). Same mounting holes/height, etc as the factory speaker surrounds. I'm guessing at this point and will verify once I get to the rear deck that they will work there as well. Some You Tube vids show folks cutting off the OEM speaker surrounds to mount new speakers but not necessary. 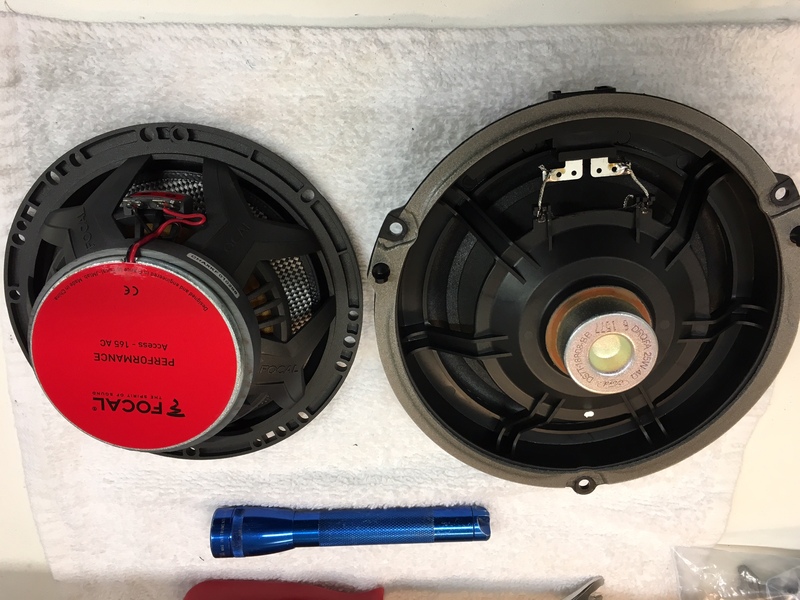 Another thing I'll need to figure out is that since Ford runs the A Pillar tweeter and 3.5" door mid range off of the same feed wires from the amp...the Focal Access 1 Crossover had a single set of input terminals with individual terminals running to the Woofer, Mid & tweeter. My initial thoughts are that I'm going to run both sets of input leads (see below) to the single set of input terminals...then run individually to each speaker from the crossover...(still going to research this before making any connections yet). I need an EWD (Electrical Wiring Diagram) on the car... blind to Fords way of wiring, sorry. I would take wiring to the door driver to your new speaker/ crossover and run mid range and tweeter off crossover outputs. Some amps will stop working if open is seen in speaker wiring. A lot to watch for. Oh, for an EWD I’d have a direct answer for you. Thanks Jim, I will consider that as well. 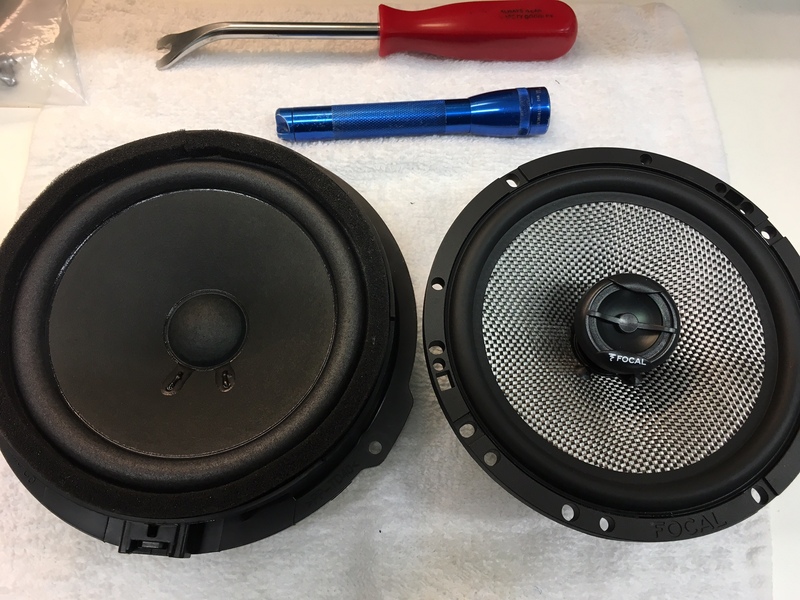 Been bz but will check with a few other forums and see what others are doing - since the 9 speaker "Shaker" system is common across the various Mustang models. I have noted in several threads, some sound shops are replacing the 3-way crossover system with a 2-way crossover system. Could be due to Ford's wiring, but not sure...since the mid and tweeter's feed off the same amp output leads, could be that our system is really a 2-way anyways. To further cloud the picture Ford uses DSP (nothing new) to limit the head unit/amp output to not blow the cheap, 25 watt OEM speakers. I'm still schooling on this aspect, but would like to eliminate those limitations as the new speakers will be able to easily handle the extra output. And still looking into adding an amp for the door speakers as well as a sub/amp for rear tire well area. Can anyone post the Shaker Audio System EWD? I guarantee you any design incorporates less wire not more. Copper isn’t cheap. Wiring is a cost cutting area for all manufactures. They can almost make a one wire car based on networking of the computers (which they do). If there is any plans of running anything audio at higher amp than stock I would be upgrading speaker wiring anyway. On another note, I used the Metra 82-5605 Speaker Plate adapter, same height and mounting holes as OEM. No need to reuse OEM speaker mount. Also the Metra Speaker Wiring Harness 72-5602 made connecting the Focals a plug-n-play, no splicing necessary. I have the 9 speaker Shaker in my 350 and was thinking about installing a JL Audio amp and 2 6 1/2" woofers in the package shelf. Was wondering did the focals you installed make a dramatic difference? I'm trying to get some addional highs as well as additional base without tearing the car apart. Last edited by hobbie1; 03-26-2018 at 12:37 AM. I also wanted more depth out of the sound when I first got the car and took it to my hi-end stereo shop here in San Diego (they work on all the expensive exotic cars) and they told me that the Shaker system has to use the Shaker speakers, if you replace them with different speakers there is an unwanted side effect, a sound that is like when you are driving a sedan and one of the back windows is down a crack and it gives an unbearable rumble sound. This has something to do with how the GT350's exhaust sound is fed through the Shaker amp system. The only way to use aftermarket speakers is if they come up with a module that will allow for this connect, but at the moment there is none. just live with the system as is. I've found that if I turn the stereo way up it's not that bad.